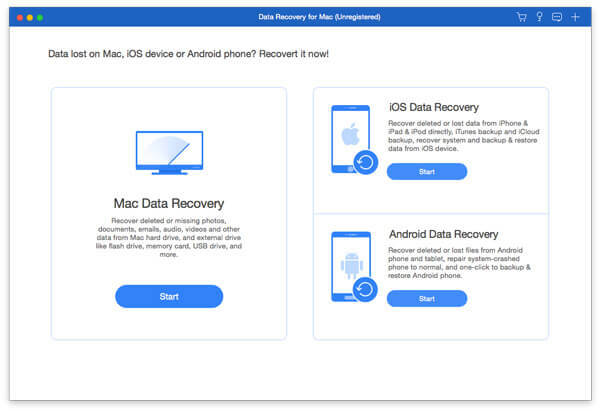 Apeaksoft Data Recovery for Mac can recover files from Mac computer, recycle bin, hard drive, flash drive, memory card, digital camera, mobile phones, etc. It can also recover data from storage devices with the file system NTFS, FAT16, FAT32, exFAT, EXT, and more.Key features1. Recoverable DataAny frequently-used data type can be recovered by this data recovery software,such as pictures, songs, videos, documents, emails and other files.2. Fast scanning speed&Reliable data recoveryApeaksoft Data Recovery for Mac has the capability to scan the deleted files with faster speed. When you restore lost videos, photos, music, documents, emails, etc. from your computer, Data Recovery won\'t store any of these data. It will 100% guarantee your privacy safety. Moreover, you are allowed to directly recover the scanned data while the scanning.3. Support various devicesIt can help you recover all types of data from computer, recycle bin, hard/flash drive, memory card, etc. It can also recover data from storage devices with the file system NTFS, FAT16, FAT32, exFAT, EXT, and more.4. Easy data recovery for all situationsData loss due to wrong formatted drives, unexpectedly operations, partition deleted, software unexpected crashes, inaccessible drive, virus attack, etc. Also it\'s very easy to use. BestSync is a professional utility for synchronizing/backup file and mail between net drive, shared folder, FTP server and USB drive with security and advanced features. Get Windows Backup recovery software can help you to restore XP backup to Windows 7 and also repair & recover corrupted Windows backup file and extract all files from corrupted Windows backup data.